Deertrap Mountain is another fairly remote viewpoint that requires many miles of hiking, but its beauty is well worth the effort for a strong hiker. 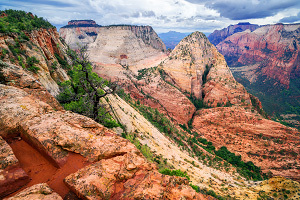 You can see everything from this mountain: the majestic White Cliffs surrounding the main canyon, Angels Landing and the Zion Lodge far below, and even Springdale in the distance to the south. Not too many people venture up here because it is just a little too strenuous for your average day hike, so it is a great spot for solitude. Note: The elevation gain on this hike is roughly 2,100 feet. While the return hike is considerably less strenuous, the route through Echo Canyon and the final descent can be hard on the knees, so take it slowly. This hike has warn out even the best of hikers! Round-trip distance: 17.5 miles. Starting at the East Entrance parking lot, the East Rim Trail gradually climbs almost 1,000 out of the east canyon and up to the plateau above. Along the trail, we get interesting views from the heads of two little side canyons. The rest of the hike along the plateau is pleasant enough although not very photogenic. After roughly 6 miles of hiking, we reach the spur trail to Cable Mountain and Deertrap Mountain. Continue the route as described above. Round-trip distance: 19.5 miles. Probably the least popular route is from the trailhead at the border of the park behind the Zion Ponderosa Resort, accessible via 4-wheel drive roads off of the North Fork Road east of the park. This hike starts in a charming ponderosa forest and follows an access trail that leads into the park to intersect with the East Rim Trail. Round-trip distance: 9.5 miles. Deertrap Mountain and Cable Mountain Map. Once the Deertrap Mountain Trail splits with the Cable Mountain Trail, the final three miles wander up and down several hills in the upper plateau. 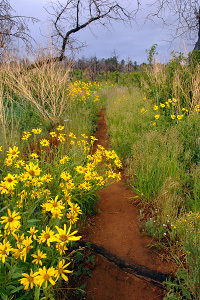 During the summer months, the trail can be quite overgrown and peppered with beautiful wildflowers. Soon enough we reach the initial viewpoint peering over the main canyon. Mountain of the Sun appears majestically in the foreground. 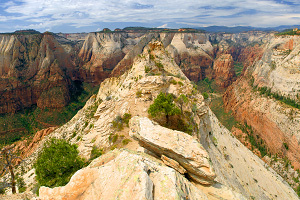 Continue hiking north along the rim for more breathtaking views. Note: Although not officially part of the trail, you can also explore south along the rim to get interesting glimpses into the upper East Canyon. The hike to Deertrap Mountain is long and strenuous and probably won't appeal to everybody. But for those willing to put in the effort, the continual viewpoints along the rim are some of the best that Zion has to offer. This is a great mountain for solitude.